When we think bone health we have been taught to think of calcium however bone health is about much more than just calcium. To get calcium into bones you need vitamin K2. Studies link vitamin K2 to the inhibition of arterial calcification. Vitamin K2 is shown to be effective in improving arterial stiffness. Children have the greatest need for k vitamins as they grow rapidly and lay down the foundations for healthy bones later in life. Calcium serves many important roles in the body, most notably perhaps would be providing structure and hard­ness to bones and teeth. Inadequate calcium intake can lead to decreased bone mineral density (BMD), which can increase the risk of bone fractures. For healthy bones calcium needs to be deposited into bones and vitamin K2 has been found to be the key nutrient that makes that happen. Recent scientific evidence suggests that elevated calcium consumption accelerates calcium deposits in blood vessel walls and soft tissues, which may raise the risk for heart disease. In contrast, vitamin K2 has been shown to prevent arterial calcification and arterial stiffening, which could be a means of lowering calcium-associated health risks. In fact, studies have shown that by striking the right calcium-K2 balance, it may be possible to fight osteoporosis while preventing the calcification and stiffening of the arteries. Vitamin K consists of a group if fat-soluble vitamins that are essential for normal blood coagulation and also to efficiently utilise calcium for healthy bones, arteries and soft tissues. There are two naturally occurring forms of vitamin K – vitamin K1, or phylloquinone, and a group of menaquinones known as vitamin K2. Both vitamin K1 and vitamin K2 play important roles in the body. Vitamin K1 is most valuable for its role in blood coagulation, however its range of proven benefits is surpassed by what vitamin K2 provides in the body. Namely, vitamin K2, in particular as MK-7, has been shown in multiple studies to deliver bone and cardiovascular support, primarily due to the fact that it stays in the blood longer, it is more bioefficient, and has additional functions not seen in K1 due to the presence of a different side chains. Vitamin K2’s strength comes from its very structure: its different side chains. Scientific findings have shown that vitamin K1 cannot deliver all of vitamin K2’s benefits because it lacks this important component. The length influences their abilities to reach different tissues in the body: the longer the side chain (7-9 units) of the vitamin K, the better its potential for extra-hepatic effects. There appear to be several modes of action of Vitamin K2 particularly MK-7. Where bone health is concerned, vitamin K2 activates osteocalcin, a protein required to bind calcium to the mineral matrix, thus strengthening the skeleton. Higher blood levels of activated osteocalcin are associated with decreased risk of fracture. With circulation, adequate intake of vitamin K2 has been shown to lower the risk of vascular damage because it activates Matrix Gla Protein (MGP), which inhibits calcium from depositing in the vessel walls. Hence, calcium is available for other roles in the body, leaving the arteries healthy and flexible. The problem is that the activation of these proteins is reliant on the body having enough vitamin K2. Unfortunately, the typical diet contains insufficient amounts of vitamin K2 to adequately activate MGP, which means about 30% of vitamin K2-activated proteins remain inactive. Bone is comprised of a hard outer shell and spongy inner tissue matrix, which is a living substance. The entire skeleton is replaced every seven years. This process is regulated by osteoblasts, cells that build up the skeleton, and osteoclasts, cells that break down the skeleton. As long as the bone-­forming activity (absorption) is greater than the bone-breakdown (resorption), the process of maintaining healthy bones will be kept under control. Osteoblasts produce a vitamin K­-dependent protein called osteocalcin. This protein helps bind calcium to the bone matrix, leading to increased bone mineral content. Consequently, the skeleton becomes more resistant and less susceptible to fracture. Osteocalcin needs vitamin K2 to function optimally. K vitamins are proven to be involved in maintaining bone integrity. A study performed by Knapen et al. (2007) shows clear evidence that vitamin K2 is important for the maintenance of bone strength in post menopausal women by improving bone mineral content (BMC) and femoral neck width, which strengthen bone. This study revealed that vitamin K2 is able to prevent bone loss. Calcification was once believed to be an irreversible result of aging, contributing significantly to cardiovascular risk. However, it is known that calcium accumulation is an actively regulated process involving vitamin K2 dependent Matrix GLA Protein (MGP), the most potent inhibitor of calcification presently known. It is carboxylated MGP in tissues that binds calcium and inhibits it from depositing in the vessel walls. By binding calcium MGP contributes to removing calcium from the arteries, keeping them “cleaner” and more flexible. However in order to perform its inhibitory function MGP needs to be activated by vitamin K2. Vitamin K2 deficiency results in undercarboxylation of MGP (ucMGP) impairing its biological function. Evidence suggests that there is a massive accumulation of ucMGP in atherosclerotic plaques as well as in other calcified areas. Research shows that calcification of arteries is a dynamic process similar to calcification of bones. In many cases, individuals with poor bone health also have poor cardiovascular health. Inadequate dietary vitamin K2 seems to be the common denominator. Results of a new double-blind, randomised clinical trial (Knapen et al. 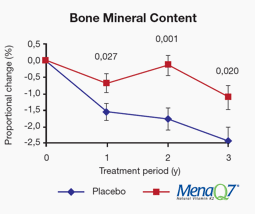 2013) shows that when taken in daily doses (180ug) for three years, menaquinone-7 improves bone mineral density, bone strength and cardiovascular health. Vitamin K2 helps the body efficiently utilise calcium. By activating different K-dependent proteins, it directs calcium toward bones and away from the arteries. Children have much higher bone metabolism than adults, which means they need more vitamin K to build healthy bone tissue. Unfortunately several studies have shown a pronounced deficiency of vitamin k dependent protein in children. In the majority of the children examined elevated inactive osteocalcin was observed. This indicates poor vitamin K status which would be considered insufficient for the higher metabolic requirement during growth. A 2004 study suggested that the true requirement for k vitamins may actually be much higher than the current recommendation. The higher peak bone mass they achieve, the lower the risk of poor bone health and potentially osteoporosis later in life. Unfortunately, food consumption statistics indicate that vitamin K intake is declining in Western societies. A dose of 45mcg daily would be a satisfactory dose for children. Why isn't taking calcium enough for bone health? -Bone Health: The entire skeleton is replaced every seven years – the process is regulated by osteoblasts (cells that build up the skeleton) and osteoclasts (cells that break down the skeleton). Osteoblasts produce osteocalcin, a K vitamin-dependent protein that helps bind calcium to the bone matrix, increasing bone mineral content and making the skeleton less susceptible to fracture. -Cardiovascular Health: Vitamin K2 also activates the matrix Gla protein (MGP), which research has shown to be the most potent inhibitor of vascular calcification. So with osteocalcin and MGP activated, calcium is directed away from the arteries (where it doesn’t belong) and to the bones (where it does belong). Is the difference between K1 and K2 simply the time in the body? Do both forms have the same action? Phylloquinone (vitamin K1) has a short half-life and mainly concentrates in the liver where it is essential for blood clotting. Menaquinones (vitamin K2 family) have a longer side chain than vitamin K1, which means they have a much longer half-life and therefore can get to bones and soft tissues where they can be used for calcium utilisation. At this stage it appears that both K1 and K2 do have some similar properties however due to the longer half-life of the menaquinones they are more active in calcium utilisation. There is evidence emerging to suggest that K2 has properties that K1 is not necessarily involved with (particularly in relation to things like down-regulation of NFkB and TNF-alpha, activation of Matrix Gla protein and brain cell mitochondria function etc). Is K2 better than K1? The question is not about vitamin K2 being better than vitamin K1 its rather about the function and what each is more useful for. Vitamin K1 has a short half-life and mainly concentrates in the liver where it is essential for blood clotting. Vitamin K2 has a much longer half-life than vitamin K1 and therefore gets to bones and soft tissues where it can be used for calcium utilisation. Do K1 and K2 work together? A number of population-based studies have investigated the beneficial health effects of high vitamin K intake. Some studies have only focused on vitamin K1, but in all studies in which K1 and K2 were measured separately, the health effects of K2 were more prominent than those of K1. Moreover, the limited data available suggest that the “long-chain” menaquinones (MK-7, MK-8, and MK-9) are the most active compounds for health effects beyond haemostasis. Can I find vitamin K2 in food or only in bottles? Attaining adequate vitamin K2 from diet is ideal. Unfortunately, that just isn’t terribly likely. For example, one of the best sources of vitamin K2 in Western society is from fermented cheeses. In order to attain an effective amount of vitamin K2 (studies have shown as little as 45 -50 mcg of vitamin K2 can produce the desired effect), one would have to consume 59g of hard cheese a day. So, obtaining optimal amounts of vitamin K2 through diet alone is difficult, which makes supplementation a viable alternative. The most desirable form of vitamin K2 is natural vitamin K2 as MK-7, as this is the most bioavailable, bioactive, and longest-lasting form. NattoPharma, an international biotechnology company and exclusive supplier of MenaQ7®, the original vitamin K2, has long partnered with Maastricht University in The Netherlands, which is the world’s largest research institute dedicated to vitamin K2. These scientists have produced findings that clearly demonstrate not only vitamin K2’s role in bone health, but that it is safe and effective for children. Are there any known contraindications for vitamin K2? The only contraindication for vitamin K2 is the use of coumarin derivatives as oral anticoagulants. These are vitamin K2 antagonists and therefore cannot be used with vitamin K2. This group of drugs includes warfarin. Fortunately, today we are seeing a new generation of oral anticoagulants that are direct thrombin and factor Xa inhibitors. These drugs can be combined with vitamin K without hesitation. Heparin produces its major anticoagulant effect by inactivating thrombin and activated factor X (factor Xa) through an antithrombin (AT)-dependent mechanism. So, in our opinion, it is safe to use with K.
It is always best for to consult your prescribing GP before adding a K2 supplement, particularly if you are on oral anticoagulants. Should vitamin K2 only be offered where low bone density has been diagnosed? Vitamin K2 requirements are higher in children and menopausal women. Dietary intake and family history of low bone density should be taken into account. Epidemiological studies suggest that most people on a standard western diet are deficient to some extent in vitamin K2. As with osteoporosis and cardiovascular disease it is better to strike before symptoms are presenting because that usually means the conditions are drastically advanced. What is the timeframe for bone mineral density improvement? The resorption process (i.e., break down) of bones is a natural process, but it is very slow. If you are an adult, your bone becomes less dense each year. While this happens very slowly, over many years it can lead to osteoporosis and fractures. Vitamin K2 has been shown to effectively decrease the bone resorption process. The process was significant after 3 years of treatment with nutritional dosage (180 mcg) of vitamin K2 – MK-7. What effects does K2 have on osteoporosis and how soon should patients see an improvement? From a scientific perspective there is no evidence to suggest that you can completely reverse osteoporosis. However, studies have shown that vitamin K2 can slow the process of bone resorption and decrease the risk of fracture. Research suggests that at a dose of 180mcg daily maximal levels of osteocalcin carboxylation are reached after 1 year of supplementation and are maintained by supplementation after that. Effects of MK-7 supplementation on bone mass are seen only after 2 years of supplementation. The Knapen et al. (2013) study showed that only after 3 years of supplementation did the bone health start to improve compared to placebo. In the Knapen study there were significant difference at the site of the lumbar spine after the first year of supplementation for bone mineral content BMC and after the second year for bone mineral density (BMD). What is the timeframe for cardiovascular benefits? In healthy volunteers, a biochemical effect (i.e., improved activation of the vascular calcification inhibitor Matrix Gla Protein, or MGP) is seen within 6 weeks, with a maximal effect after 3 months. It is suggested that from that time on there will also be a clinical benefit for the subject, but these processes proceed slowly and a measurable benefit in a clinical trial (vitamin K2 over placebo) becomes visible after at least one year, with a more pronounced effect after 2 and 3 years. Is it necessary to stay with the 180mcg dose or will increased dose improve results? Research has shown that there is no perceived added benefit of dosing any higher than 180mcg. Blood and tissue levels reach acceptable levels within 3 months and increasing dose does not improve that. Yes! Children have much higher bone metabolism than adults, which means they need more vitamin K to build healthy bone tissue. The higher peak bone mass they achieve, the lower the risk of poor bone health and potentially osteoporosis later in life. Unfortunately, food consumption statistics indicate that vitamin K intake is declining in Western societies. A dose of 45mcg daily would be a satisfactory dose for children however the TGA do not allow labeling for children at this stage. Before the advent of processed foods, diets provided adequate amounts of vitamin K2, but fast-paced lifestyles have us dependent on convenient, nutrient-lacking foods that have led to dire deficiencies, particularly in children, which leads to unhealthy adults. In fact, recent studies show that adults above the age of 40 are second only to children when it comes to having the largest vitamin K2 deficiency. Studies show that improving vitamin K status in children over a 2-year period resulted in stronger, denser bones. Bioavailability studies show that all-trans synthetic vitamin K2 as MK-7 has a similar bioavailability profile to natural vitamin K2 as MK-7. Natural vitamin K2 is found in bacterially fermented foods like mature cheeses and curd, but the best source is the traditional Japanese dish “natto,” which is made of fermented soybeans. Many studies have found that natto consumption in Japan has been linked to significant improvement in K vitamin status and bone health. Unfortunately, the intense smell and “controversial” taste make this soy-food a less attractive source of vitamin K2 for the Western population. Other sources of vitamin K2 are fermented cheeses, curd and very small amounts in egg yolk and meat. Despite the strong epidemiological evidence showing that dietary intake of vitamin K2 may improve overall health status, it was not until a 3-year ‘breakthrough’ study of MenaQ7® vitamin K2 as MK-7 that there had been a clinical trial to show that only a long-term (more than 1 year) supplement of vitamin K, especially MK-7, improves BMD, bone mineral content, and bone strength. The double-blind, randomised, clinical trial evaluated the results of a 3-year regular intake of 180 mcg of natural MK-7 by 244 healthy post-menopausal Dutch women (55 to 65 years), randomly assigned to receive either MenaQ7® or identical-looking placebo capsules, daily. The medical community considers this study a ‘breakthrough’ because it shows clinically, for the first time, statistically significant protection with deterioration with aging. Specifically, regarding bone preservation, the study showed significant protection of the vertebrae and the hip (femoral neck) against osteoporosis and fractures due to bone degeneration. This was achieved with only 180 mcg/daily of MenaQ7®, which is considered a ‘nutritional dose,’ or a dose that can be obtained from a healthy diet. Importantly, the 3-year study showed, for the first time, substantial benefits of nutritional vitamin K2 in preventing age-related stiffening of arteries. Mehmet A, Ozdemir et al. J Pediatr Hematol Oncol 2013 The Efficacy of Vitamin K2 and Calcitriol Combination on Thalassemic Osteopathy. 2013 Pediatrics, Division of Pediatric Hematology and Oncology. Erciyes University, Kayseri, Turkey 20 Bone Health 5Omcg (menaquinone-7) and vitamin D (5mcg calcitriol). Theuwissen F, et al. Food & Function 2013 Vitamin K status in healthy volunteers 2013 VitaK, Maastricht University 42 children, 68 adults Efficacy, dose finding, absorption study Children were supplemented with menaquinone-7 (45 mcg MK- 7 per day for 8 weeks). Adults were supplemented with three different MK-7 tablets (9O mcg per day for 7 weeks). Our aim is to provide up-to-date and accurate information regarding vitamin K2. We follow closely the development of the science around vitamin K2. Our goal is to promote community awareness of the importance of vitamin K2 for optimal health. We believe that your health is your wealth and that knowledge based on good science is they key to empowering you to manage your health effectively. The aim of vitamink2.com.au is to improve quality of life for all Australians by providing proper knowledge and supporting the development of the science around vitamin k2. That is why we decided to develop this website as a credible and reliable source of current medical knowledge and the latest research on the properties of vitamin K2. We want our visitors to have the opportunity to consciously counteract the negative changes in the skeletal system and the circulatory system, so we provide interesting articles and tips for a healthy lifestyle. Our goal is to build awareness of the great healing properties of Vitamin K2 – not only for adults, but also for children. Further, vitamink2.com.au is intended to be a resource for all – consumers and medical professionals alike. Every visitor has access to the latest information pertaining to vitamin K2, from research and analysis, to ideas about attaining a healthy lifestyle. And should a visitor not find what they are searching for, we encourage them to use our Contact Form to reach out to one of our experts to answer their specific question.